Sgt. Clarence L. Floyd Jr.
Died: December 10, 2005 in Operation Iraqi Freedom. Unit: Army, 1st Battalion, 320th Field Artillery Regiment, 2nd Brigade Combat Team, 101st Airborne Division, Fort Campbell, Ky.
Sgt. 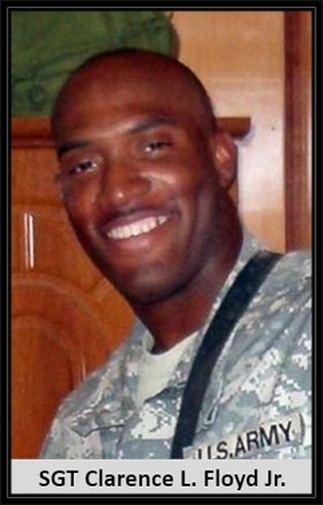 Clarence L. Floyd Jr. 28, of Newark, N.J.; assigned to the 1st Battalion, 320th Field Artillery Regiment, 2nd Brigade Combat Team, 101st Airborne Division, Fort Campbell, Ky.; killed Dec. 10 when his unit was attacked by enemy forces using small-arms fire during combat operations in Taji, Iraq. Sgt. Clarence L. Floyd Jr., 28, was a cannon crew member assigned to the 1st Battalion, 320th Field Artillery Regiment, 2nd Brigade Combat Team based at Fort Campbell, Ky. His mother and stepfather, Valerie and James Kelly, live in Newark. Floyd, a father of five, was killed in Taji, about 20 miles north of Baghdad. Family members said he was shot in the head by a sniper. Floyd joined the Army in October 2003, after holding a succession of minimum-wage jobs in New York City, hoping to be able to better provide for his family, his parents told The Star-Ledger of Newark. He was deployed to Iraq at the end of September. "He didn't go there because he wanted to go," James Kelly said. "He went there because he had to go. If these kids had jobs and opportunity, they wouldn't even enlist." Floyd was born and raised in Harlem. He earned his high school diploma while a member of the Job Corps, a federally administered education and job training program. While in the Job Corps, he assisted in relief operations in North Carolina following Hurricane Floyd in 1999. 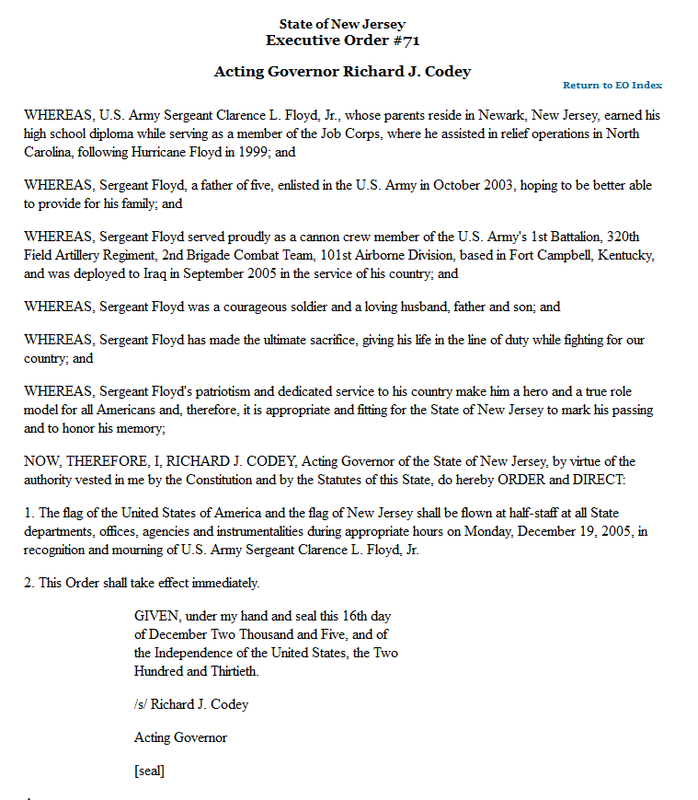 He will be buried in Calverton National Cemetery in Suffolk County, N.Y. Attempts to reach Floyd's wife, Deidra, in Fort Campbell, Ky., on Monday were unsuccessful. Floyd is one of three soldiers with the 101st Airborne killed in Iraq since Friday. The names of the other two soldiers were not released Monday evening, Fort Campbell spokeswoman Kelly Tyler said. Clarence L. Floyd joined the Army after holding a succession of minimum-wage jobs in New York City, hoping to be able to better provide for his family. "He didn't go there because he wanted to go," said his stepfather, James Kelly. "He went there because he had to go." Floyd, Jr., 28, of Newark, N.J., was killed Dec. 10 when his unit came under attack in Taji. He was trained as a marksman and was assigned to Fort Campbell. Floyd, who was born and raised in Harlem, and received his high school degree through the Job Corps, where he assisted in relief operations for the victims of Hurricane Floyd in 1999. Relatives said Floyd was an easygoing family man who enjoyed playing basketball and other sports. He also is survived by his wife, Deidra; a stepdaughter, Shyann Landis; stepsons Chequan Wise and Norman Landis; a son, Dayvon Eaddy; and a daughter, Kayla Floyd. Floyd's mother said she last talked to her son about two weeks ago. "'It's hell over here. It's nothing like what's being portrayed on TV,'" Valerie Kelly recalled him saying.